These wheels include a smooth grippy tire, which has high traction on smooth surfaces. High Traction rounded tread. Removing the tread makes a low-friction wheel. SimpleRobotics notes: Very seldom used in competition for drive wheels. Good grip on hard surfaces like tile, but only fair on form tile surface. Can be used with Standard Motor 393 gearing, high speed, and turbo gear ratios even with a heavy robot. Most often used as a wheel claw for Competition purposes. The small size allows for frames to be closer to the ground and the wheel contact with the ground to be closer to the outer corners of the drive system. The small size means less distance traveled per revolution, so they will be slower than larger wheels, but place more force to the surface. Tread can be removed. SimpleRobotics notes: An excellent drive wheel, but not used as often in competition. Good grip on form tile surface. Can be used with Standard Motor 393 gearing, high Speed, and turbo gear ratios even with a heavy robot. Most often used as a wheelie bar wheel.The small size allows for frames to be closer to the ground and the wheel contact with the ground to be closer to the outer corners of the drive system. The small size means less distance traveled per revolution, so they will be slower than larger wheels, but place more force to the surface. They are slightly larger than the standard 2.75" wheel, this can cause design issues when mixing wheel type. VEX 3.25" diameter wheels. These wheels include a tire designed for optimal grip on soft surfaces like the foam tiles used in the VEX Robotics Competition. Removable wheel inserts allow for additional versatility - use these wheels with either standard Drive Shafts or High Strength Shafts, in either a driven or free spinning application. High traction tire profile Versatile wheel inserts for a variety of applications Contains direct mounting holes for gears or sprockets Note: 3.25" rubber tires are molded directly onto the plastic hubs. They are not removable. These wheels include a tire which works well on any surface. SimpleRobotics notes:Standard drive wheels for VEX. Reasonably good grip on form tile surface of all VEX Wheels. Can be used with Standard Motor 393 gearing, High Speed. Provide competitive advantage over other wheels. Does not skid well with skid drive designs, but is difficult to push from the side. Tread can be removed. *Note: This kit includes tires only, wheel rims not included. Simply remove the current 4" tires from their plastic rims and replace them with these high traction ones. SimpleRobotics notes:These high Traction Tires have a good grip on tile surfaces, but tend to slip on the form tile competition surfaces. They do allow for a skid drive system which has some resistance when pushed from the side. Can be used with Standard Motor 393 gearing & high speed gearing. Omni-Directional wheels roll forward like normal wheels, but slide sideways with almost no friction (no skidding during turns). Use these wheels to make your robot turn smoothly or build a holonomic drivetrain. These wheels are the same size as the VEX 4" dia. Wheels. 4" Omni Wheels roll sideways with very little friction. 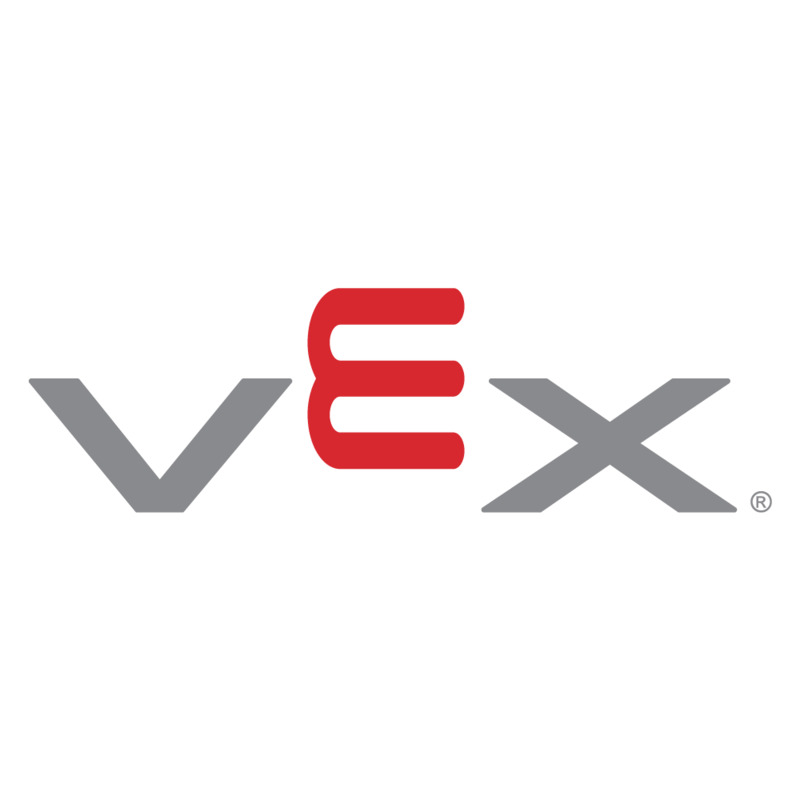 SimpleRobotics notes: These are the workhorses of the VEX robotics competition community. They have one of the highest traction of all the wheels on the foam tiles and allow for both effective skid drive and holonomic drive system. Unfortunately, they have very little resistance when pushed from the side, and they are slightly larger than the other 4" wheels so building a mixed wheel drive system requires some special design effort. Can be used with Standard Motor 393 gearing & high speed gearing. Mecanum wheels allow savvy robot designers to create drivetrains capable of moving in any direction using a standard chassis shape. Simply power each wheel with a different motor and by changing the directions the wheels spin get your robot to move in different directions! These wheels include a knobby tire which works great on rough terrain or loose surfaces. High Traction rough knobby tread.